Picking up where 30 Seconds to Mars left off on their eponymous debut, Cage9 adds the immersive troposphere of Starset’s Transmissions to the mix on their latest, Illuminator. The result is nonetheless engulfing; a sonic meld of dense layers of atmospherics (“Open Your Eyes,” “Illuminator”) and heavy alt-rock backed by steady prog undercurrents (“Starry Eyes,” “Take Back Tomorrow”). Massive lead single “Everything You Love Will Someday Die” pays homage to Coheed and Cambria’s “Welcome Home” with grandiose riffing and towering hooks, while the equally stunning “Oscuro” follows suit with chugging riffs and infectious melodies, but there is much more to be discovered on Illuminator. 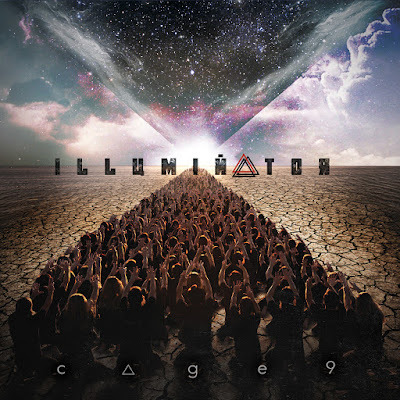 Like peeling away the layers of an onion, notable moments are unearthed as Illuminator wears on (“Aleatorcism” and “Death Of A Dragon” sound like long lost Incubus tracks, Cage9 flexes the breadth of their chops on “Birds of Prey,” one of the albums heaviest outings, frontman Evan Rodaniche is a dead ringer for Godhead’s Jason Miller on the punchy “Martyr”). Illuminator never loses steam and doesn’t fade, which speaks to how strong of a record it really is.